This is not directly related to fashion - but it's a blog article on Kent Monkman. I love his artwork and the concepts behind it. Monkman uses 'fashion' triggers like headdresses and platform shoes to discuss identity, gender, and sexuality, as well as issues pertaining to racism and colonization. I shrunk the article down a little bit, so you can read the full article here. Using parody and his flamboyant alter-ego ‘Miss Chief Eagle Testickle’, he subtly turns pioneering myths of the American West into orgiastic revisions of nineteenth-century pastoral scenes. By appropriating the imagery and technique of ‘New World’ landscape painters, and by reversing the usual roles of cowboys and Indians, Monkman questions not only history, but also notions of authenticity and identity. He goes back in time to ‘queer the frontier’. Through oil paintings, sculptural pieces, films, video and photography, Monkman creates an “Old West” as a land of cross-dressing and role-swapping play between “cowboys and Indians” and at the centre of this work is Miss Chief Eagle Testickle. Miss Chief Eagle Testickle (punning “mischief” and “egotistical”) is Kent Monkman’s performance-art alter ego and she also appears in many of Monkman’s paintings and sculptural pieces. In a mischievous and humourous manner, Kent Monkman’s art challenges the inherent stereotypes around sexuality and identity, the legacy of colonialism and narratives about Aboriginal culture in the history of art and popular culture. Behind Monkman’s art lies a deep knowledge of past images and iconography, both European and Aboriginal. With clever racial role reversals & historical revisionist satire, Kent Monkman skewers depictions of Indians in early 20th-century silent movies & studio portraits. Canadian Cree Kent Monkman is a prolific artist whose lighthearted paintings, performance art, super-8 movies, antique tintypes, multimedia presentations, & mixed media installations poke fun at racist Hollywood depictions of First Nations people in art and movies. Monkman reverses the roles in the caricaturized cowboys-&-Indians scenario so that it is the ‘Indian’ whose insists on capturing ‘the European Male’ in images before he disappeared forever, as though they were peculiar scientific specimens. Monkman’s satirical work focuses scrutiny on cultural filters. To this purpose, he created a public performance persona (inspired by popstar Cher) of a very flamboyant drag queen. In her maribou and dyed feather war bonnet, beaded and open-toed stiletto mocassins, dreamcatcher bra/breastplate and Louis Vuitton quiver, Miss Chief swans over Monkman’s visual narratives that completely revise the traditional white view of North American history. 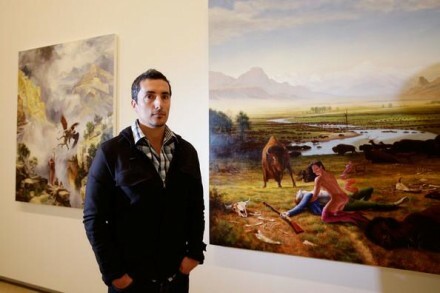 Kent Monkman was born in 1965 in Winnipeg and raised in a family mix of Swampy Cree and English-Irish descent. He is an accomplished and original painter, filmmaker and performance artist, based in Toronto, where he has lived for the past 20 years.